National Geographic Kids: 125 Pet Rescues includes some engaging stories about rescued pets from cats and dogs to rabbits and so many more. There is even a section at the end about celebrity rescues. Some celebrity animals have famous parents, while others are famous through social media and charity fundraising ventures. These stories are engaging for kids between ages 8 and 12. Some of these animals are very talented, with some even learning to surf. My daughter loved the colorful pages and the animal stories we read, and one of her favorites was Kuli who learned to surf in Hawaii, and she’s a cat. She loves surfing so much that she just jumps in her owner’s bag every time they head out to the beach. There’s also some adoptions of older animals included, which was good to see. Many times shelters have dogs and cats that are in their older years and they are not the ones people come in looking to adopt. 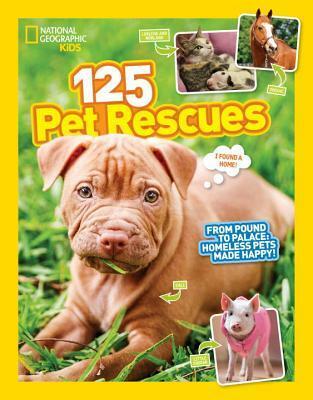 National Geographic Kids: 125 Pet Rescues best feature comes at the end with tips on how to make a difference. Besides adopting animals — especially if you can’t — people should consider donating items that animal shelters may need from food and blankets to toys and leashes. Other options include becoming an advocate for shelter animals or spaying and neutering pets to keep populations on the street low. Volunteering is another big help to shelters, especially those with little funding. Parents should consider reading this book with their child to explain why some animals are left at shelters and how they too can help these animals find the best homes.